Today’s topic is low back pain, a common complaint in many demographics. There are a lot of root causes of back pain, including herniated or bulging discs, facet syndrome, osteoarthritis, and acute trauma. Another important point is that low back pain can be divided into two main locations – Sacroiliac joints (SI joint) and lower lumbar areas. The two areas are very close in location, but very different in anatomy. People often confuse SI joints with the “hip” area of the body. In reality, the hip is specifically the ball and socket joint of the femoral head that our leg hinges from. 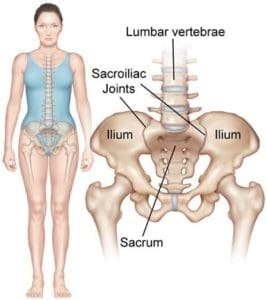 The SI joints are located at the top of the pelvis, one on each side, where the pelvis and sacrum are joined. If you feel your hip bones (ilium), and move slightly in towards the middle of your back, you can feel two bony spots that are connected to the SI joints. It is a relatively stable joint, but when one variable is not functioning well, it can cause a lot of discomfort and lead to even more problems down the chain into the hip, knee, and ankle joints. In office, an in-depth low back and hip exam is performed to determine where an individuals pain might be coming from – lumbar vertebra, SI joints, or hip joints. Then tests are done to differentiate nerve pain, muscular pain, ligamentous sprain, etc. From there, treatment usually involves myofascial release, chiropractic manipulation, and strengthening exercises. Often the treatments for many different disorders related to the back are similar, even though the specific diagnosis might vary. At home, to avoid back pain, one of the easiest things every single person can do – whether you’re an Olympic lifter or jogger, weekend warrior or simply sit in an office all day – is start with your core. The core is key to a stable low back and pelvis and gives the body a stable support to bend, twist, and move from without hurting ourselves. Several key exercises to help your low back and decrease pain and wear-and-tear on joints are dead bug (link here), bridge (here) and side bridge (here). The handouts linked above all have something in common, which is starting out by finding what we call a “neutral pelvis” (explained in detail here) and using abdominal bracing and breathing (found here). From there, with your pelvis stabilized, you can begin core work. People that proceed through these steps, focusing on stabilizing their core and using that stabilization technique through transitional movements (seated->standing, for example) often find great relief from low back pain. Dead bug exercise is often a great starting place, and incorporates a lot of floor work that may feel silly at first, especially if you have been doing core work for a long time. This exercise targets specific parts of the core and creates a cylinder of support using diaphragm, abdominals, pelvic floor, and back muscles. From there I like to progress to bridge track. It works the core and also focuses on glute muscles and quadriceps, which are often inactive when they should be active. Neuromuscular retraining through these exercises allows your body to utilize important muscle groups that may not be in use on a daily basis. Another helpful tool for decreasing low back pain is adding foam rolling into your daily regime. It can be painful at first, but rolling your glutes, IT bands, quads, and hamstrings can be beneficial for many people.